the Best Possible Patient Experience! Located in Spring Grove, IL in MCHENRY COUNTY the leading health professionals at Back in Motion Physical Therapy and Spine Center are dedicated to helping you achieve your wellness objectives. A multi-disciplinary approach is used combining skills and expertise of Chiropractic Physicians, Licensed Physical Therapists, Licensed Massage Therapists and Acupuncturists to provide you with the absolute best care in all of McHenry County! The Back in Motion Team is committed to bringing you better health and a better way of life by teaching and practicing the true principles of wellness care. We use safe, gentle and effective therapies to make you feel as healthy as possible! 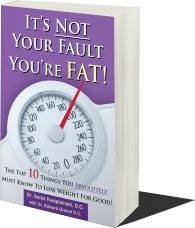 Dr. Sonia Kwapisinski, Author, of her New Book, "It's Not Your Fault, You're Fat!" An easy, fast and healthy way to lose weight! See Dr. Kwapisinski on LifeTime Television Show "The Balancing Act".